An artist's concept of the LRO as it orbits the moon. A NASA probe orbiting the moon is broadcasting live cosmic tunes from a computer near you. 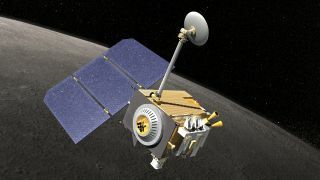 NASA's Lunar Reconnaissance Orbiter (LRO) has a new internet radio station for people who want to check out space weather through music. Operating in real time — as long as the craft isn't behind the moon — the station plays music that changes in pitch and instrument based on how much radiation the spacecraft experiences. Launched in 2009, LRO orbits the moon as it maps its surface. The craft carries with it a Cosmic Ray Telescope for the Effects of Radiation, or CRaTER. Six detectors on the instrument measure the radiation from solar activity and galactic cosmic rays. An online radio station plays the space weather data from NASA's LRO mission in musical form. The detectors measure how many energetic particles are registered each second and sends the information to CRaTER Live Radio, where software converts the measurements into pitches in a four-octave scale. Six pitches are played each second — one for each detector. Low pitches indicate high activity, while higher pitches indicate lower counts. As activity increases, the musical instruments scale as well. The main instrument at the lowest level of activity is a piano. Two instruments up, it becomes a marimba. Further activity is indicated by a steel drum or a guitar, while the peak of normal activity is indicated by the strum of a banjo. During the course of a significant solar event such as a solar flare, radiation activity may exceed the normal operating range. In such a case, the software creates a second operating range with the piano at the bottom and banjo at the top, but the background violin and cello scales. A drop in pitch for the background instruments indicates a move to the secondary range. LRO broadcasts 24 hours, and is live at all times except when the craft travels behind the moon. During this blackout period, the station reuses the previous hour's activity, changing the sound of the background bongo drum and muting the chiming triangle. The process, known as sonofication, converts data into sound and has been utilized in a number of fields on a variety of missions, including Voyager 1, Voyager 2 and Kepler. "Music makes it easier for people to take in the data, and it seems to be a natural fit for space missions," LRO project scientist John Keller, of NASA's Goddard Space Flight Center in Maryland, said in a statement.